A totally self-contained cassette to MP3 converter. Simply insert your cassette tape, and your favourite USB drive, and you’re ready to go! No computer required, and it couldn’t be easier! It’s battery powered (2 x AA) or power from a USB port (cable included). With its sleek black design, this device will fit any pocket and is suitable for all tape types. A brilliant gift for the avid cassette collector, or the perfect addition to your own music cabinet. Format: MP3. Used once, very good condition. Outer box has some wear and tear as shown from storage and handling. For your computer, for iPod or car playback device. You can connect an old-fashioned record player to your device and convert your records to MP3 songs. Portable design. Can be used as a normal cassette player. Item is used in a very good cond. Tested Working. Tested and working. Requires a mini USB lead (not included). With the Cassette2CD Wizard 2.0 software, you can easily transfer your cassette tapes to audio CD or MP3 files. Just plug in your converter and start recording using the software. NOTE: Cassette2CD Wizard 2.0 is compatible with Windows 10/8/7/Vista/XP/2000. This auction is for the following : Shintoku Tape Converter Still sealed In Packaging With Instructions And Cable. ​See In photographs. USB Cassette Player is a portable, handheld USB tape that works with all kinds of tapes. It has an easy-to-use USB connection for converting the music on your tapes into MP3 files. You can listen to MP3’s on your computer, load them onto your portable music player, or record them onto a CD and listen in your car. Press the “OII” button. The flashing green right indicates that the convert is on process. 1 Piece Earphone. 1 Piece Cassette tape to mp3 USB flash drive converter. Insert a USB Flash Drive directly to the device using battery; if connect the USB Flash Drive to the device with the USB cable, it should be connected in the way as Picture 4 shows. Convert your old mix tapes and cassette to MP3 to Playback on iPod/MP3 player or burn to CD. Rediscover your old cassette tapes on the go. 1 x USB Cassette Capture. Portable design fits in virtually any bag and enables you to play and transfer anywhere. Convert old mix tapes and tapes to MP3, iPod and MP3 PAL raid or burn to CD. 1x Cassette Tape Player. - 512MB RAM or above, 1GB hard disk space. - With tape conversion software to guide you through the transfer. Convert cassette tape to MP3 format, no computer required. The converter records your tape on a USB flash drive, then it can be transferred anywhere. - With the auto mode, this cassette to MP3 player will save each audio into a separate MP3 file. Converts tapes/cassettes to MP3 format with special software for storage. Easy to use and you can transfer the MP3 file. 1×USB Cassette Converter. You can listen to MP3 on computer, load them into your portable music player, or record them into CD and listen in your car. You can play the tape with this cassette capture, and the cassette capture can also be used as a music player. Cassette capture can can directly transfer your old cassettes or tapes to your USB Flash Drive(NOT included) in MP3 format. Convert your old mix tapes and cassette to MP3 to Playback on /MP3 player or burn to CD. 1 USB cassette player. Rediscover your old cassette tapes on the go. Portable design fits in virtually any bag and enables you to play and transfer anywhere. With this ezcap232 cassette tape to MP3 converter, you can easily convert your old tape to MP3 without a computer and automatic partition each songs of tape, you just need to plug a Micro SD card on then press “record” button, the device will convert all the music on tape to your Micro SD card in MP3 format automatically. Cassette tape to mp3 converter：Via a USB cable, you can convert old mix tapes and cassette to MP3 to Play on iPod/MP3 player or burn to CD. - With this cassette tape to MP3 converter, you can easily convert your old tape to MP3 without a computer (It can NOT be converted by the pc via USB). USB Cassette Player is a portable, handheld USB tape player that works with all kinds of tapes. It has an easy-to-use USB connection for converting the music on your tapes into MP3 files. You can listen to MP3’s on your computer, load them onto your portable music player, or record them onto a CD and listen in your car, Its portable size allows it to fit in virtually any bag and enables you to play and transfer music anywhere. Convert old mix tapes and cassette to MP3 / for iPod / CD. 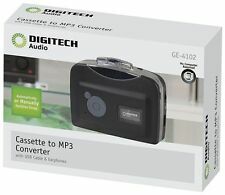 Cassette to MP3 Converter - Easy to use. 1 Earphone. You can listen to tape, but you need to wear headphones. Convert music or listening materials on old tapes to MP3 format. The USB walkman cassette player cassette tape to MP3 converter, you can easily convert your old tape to MP3 without a computer and automatic partition each songs of tape, you just need to plug a USB flash disc on then press “record” button, the device will convert all the music on tape to your USB disc in MP3 format automatically. Turn your tapes into digital music files and listen on your computer, iPod, or in the car! tape 2 Go is a portable, handheld USB tape player that works seamlessly with any cassette tape. 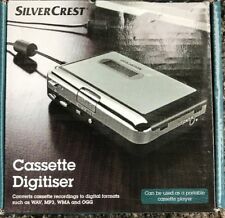 It has an easy-to-use USB connection for sending the music from your beloved tape collection right into your computer where it's instantly converted into a digital music file. Converts your precious cassette collection to MP3. - Can be used as personal cassette player. - USB Cassette Player. - Recording Format: Wave, MP3. - Compact and portable design. - USB Cable. - One available USB 2.0 port. USB Cassette Player is a portable, handheld USB tape player that works with all kinds of tapes.It has an easy-to-use USB connection for converting the music on your tapes into MP3 files. - Converts your precious cassette collection to MP3.